ITEMS FROM DE ANZA HIGH SCHOOL SAVED! Just before the old school was permanently closed for demolition, representatives from ESHS were allowed to remove artifacts of historical interest before they were hauled off for destruction. Below are examples of some of the objects that we found and that have become a part of the collection of the El Sobrante Historical Society. School Sign: This sign was mounted in front of the entrance to the old school for many years, though it probably is not the original sign. School Clocks: We were able to secure 22 of these old-timers. According to the date stamp on the backs of the clocks, almost all of them were manufactured in 1954, before the school opened in 1955. They came in two sizes, 12" and 10." Technically, they are referred to as "slave clocks," as they are all controlled by one "master clock" which allows them to keep exactly the same time. But this also means that they cannot operate independently. At the upper left is one of the many intercom units that were placed throughout the school. Next to it is a school bell, taken from the main hallway. At the bottom left is an old pencil sharpener, which may have been in use when the school first opened. control panel, controlling the school bells, which was located in the office. At the left is a door to one of the many lockers in the school. Unfortunately, we could not take out an intact locker, as they are welded together in a unit much too large to remove. We have 7 De Anza shirts, most of them apparently for use by the staff. One of them is labeled for use by the principal, who is also characterized as a "conflict mediator." The warning signs were placed at various sites in the school, to remind students of the gravity of maintaining proper decorum. For the most part, we were not able to access many of the classrooms. So most of the items collected come from the offices and the library. However, we were lucky enough to gain entry into one of the science rooms, at the eastern end of the school, just opposite the shops. There we found these pull-down charts of beautifully drawn examples of animal and plant biology. We were able to save 15 of these charts, which would otherwise have been destroyed. Over the years, how many thousands of students have learned the basics of plant and animal structure by looking at these wonderful drawings, which are still useful today. These pennants were donated to ESHS by Kenyon Chan, the son of Martha and Gene Chan, who owned and operated Manor Market on Manor Road for well over 30 years. Kenyon attended all three schools. These pennants are in remarkably good condition and show very little wear. They date from the mid 1950s to the early 1960s. Before computers and calculators, there was the Slide Rule. With a little training, the budding engineer could perform very complex calculations on this deceptively simple, and fool-proof device. This slide rule was owned by Maurice Abraham, who graduated from De Anza High School in 1960. The slide rule was supplied by the school. This cross-section of a narrow-gauge railroad tie was donated by Maurice Abraham, who purchased it on E-bay. 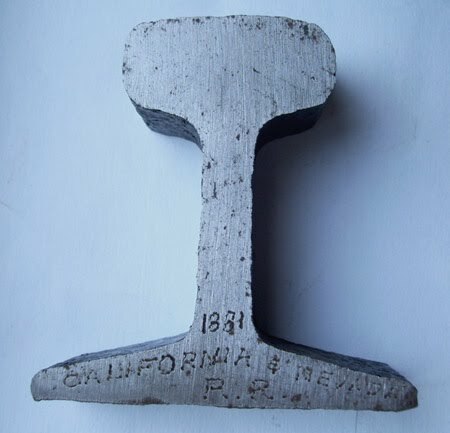 Inscribed on the piece is the date "1881" and the wording "California & Nevada R.R." The C&N Railroad was incorporated in 1881 and ran from Emeryville through El Sobrante and to Orinda. The last run was made in 1899. It appears to be authentic, and, if so, is one of the very few artifacts that have survived related to the C&N line. The railroad once ran through the area that is now Kennedy Grove, and the names of the picnic sites take their names from old railroad stops. Update: Based on existing records of the dimensions of the C&N narrow-gauge track, Maurice has been able to determine that our piece is an exact match for that used by the C&N line. 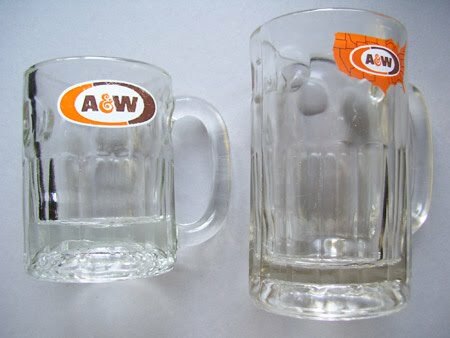 These A&W Root Beer Mugs were donated by Shirley Rowles, whose mother worked at the A&W Root Beer facility in El Sobrante. The exact dates of its operation are uncertain, but it was in business from at least 1960 to the mid 1970s. It was located on the north side of the San Pablo Dam Road, just west of the intersection with El Portal. The logos tell us something about the age of these mugs. The logo with the U.S. map was only used between 1972 and 1976, so the larger mug falls within those dates. The other logo was in use in 1968, then changed slightly in 1969, and then returned to use in 1976, remaining unchanged till the mid 1990s. So the smaller mug either dates to 1968 or probably to the late 1970s. 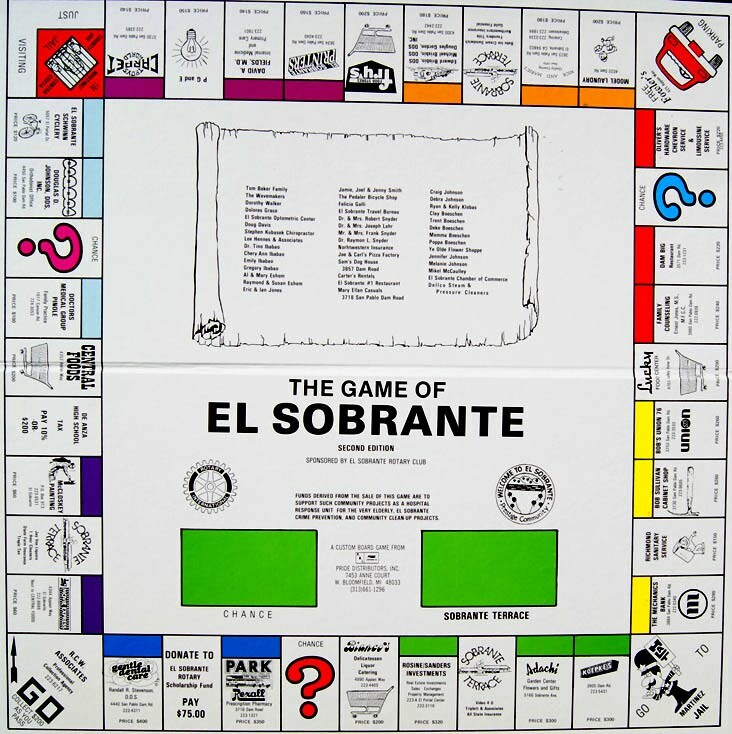 The Game of El Sobrante was put out by the local Rotary Club in the late 1970s. Many, if not most, of the businesses on the game are no longer in existence. Donated by Steve James. 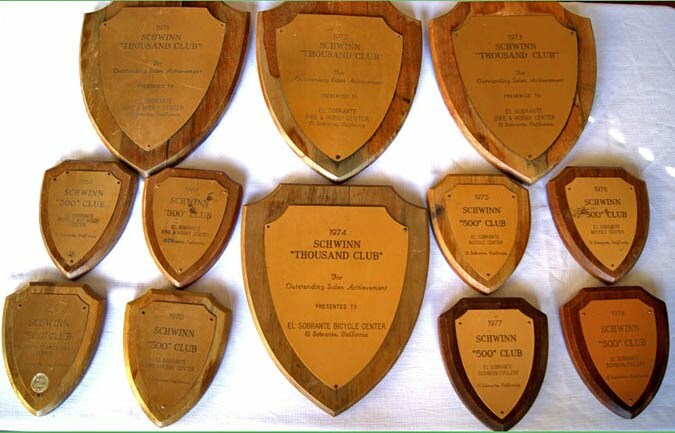 Bob Letford, founder of the El Sobrante Bicycle Center, donated these plaques, awarded by the Schwinn Company for outstanding sales performance. The business is still going strong, with son Gary now in charge. 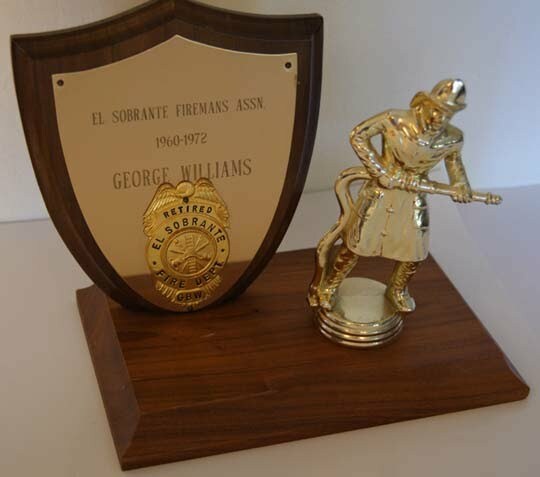 George Williams served for twelve years as a volunteer fireman for the ESFD, while living in El Sobrante and working for the Chevron Refinery. George was proud of his service, which was often dangerous. One incident led to a facial wound that required 32 stitches to close. In 1972, he and his wife Charlotte moved to Vallejo. George passed away in July of this year. The plaque and photo here displayed were donated by daughter Shelley.